This project was created on 01/20/2014 and last updated 4 days ago. I&apos;ve had complaints from non-members that they can&apos;t read / follow my project without signing up for a Hackaday.io account... which is a disincentive for me to continue to publish my content here (since I will have to republish for non-members). Thanks for checking on this. The source of confusion is undoubtedly lack of technical savvy and/or fear of the unfamiliar. Maybe only members should see platform-specific options, while non-members see a different set of actions -- like "join Hackaday.io" to receive updates about this project, etc. Ultimately, the decision depends upon what Hackaday.io wants to be: a smaller community of technically-savvy people, or a larger tech content provider for a diverse audience. Do you share your profile https://hackaday.io/kellyheaton or a direct link to your project https://hackaday.io/project/161443-hacking-natures-musicians ? I noticed you have a lot of &apos;THINGS I&apos;VE BUILT&apos; entries, I wonder if they are confusing those for full projects. The other stuff on my profile is just background information that is documented elsewhere on the web. Not all text input fields are checked. Mozilla Firefox only spell checks multi-line text fields, so I didn&apos;t notice some misspellings in my components list until I copied and pasted it into an office app. So it would be nice if Hackaday would change all single-line text fields to multi-line. Was / is anyone elses feed counter broken? yay :) I see a number! Hey guys.. What&apos;s the story with images disappearing? I have multiple images dissapaearing from few projects? How do we get them back? Thanks! It shouldn&apos;t be happening. I&apos;ve sent you a PM. would be cool to get a link to a comment. I wanted to share a response on twitter, but was only able to share the link to the project. You can get links to comments. The "3 hours ago" is the link, e.g. https://hackaday.io/project/37-feedback-hackadayio/discussion-113041 for your comment that I&apos;m replying to. For some reason it isn&apos;t a link in the feed though, just on the actual project page. Yeah it&apos;s not easy to find, a &apos;More&apos; menu for each comment could fill that role. I&apos;ll make a note. About notification : I think that there is no e-mail notification when someone writes a comment to a "blog post" inside one of my project. On "account settings / notifications", I don&apos;t see anythink like that. If it is correct, could you please add this feature? You may be right, I&apos;m not sure if there is a notification email for a comment to a blog post yet. it would be nice if hackaday.io offered the ability to use custom URLs and/or Domain names for project and profile pages. I joined a month ago. I followed exactly two projects. Log in this morning, suddenly I&apos;m somehow following 100+ projects and 100+ people -- which I never did myself. Spent 30 mins unfollowing all the crap, but if it happens again will be deleting my account. If you have a problem with your account PM me and I can help get it resolved. thank you sir. will do. +1 same problem here. I needed to "unfollow" lots of projects and lots of users, that I have never ever selected myself. It seems that lots of accounts receive unfair "following". It&apos;s very easy to see that : some users have more than 10 000 followers with almost no contribution. There is a bug? Or the database has been hacked? I always thought that my followers come from that "onboarding" process, where you click yes or no if you like something and through that you follow stuff. Even worse when it happens without you "choosing" something. Onboarding does have a link to show a page of projects/people that will follow, and can be unfollowed before continuing. I have just tested once again the "onboarding process" with a fake account that I will delete in a few days. OK, with my "interests", it has selected less than 10 projects, and not a single person. It is not comparable with the dozens of people and dozens of projects that I was following on my real account, and which I had never ever selected! I think that there is a very big problem. If thousands of accounts are forced to follow and forced to "like" people they have never selected, hackaday should treat this issue with high priority. Not sure if anyone else has this issue, but for some unknown period of time I&apos;ve stopped receiving email updates for project posts/messages. Is this a known bug? Hi @Paul Larson! I&apos;m getting email updates. You can manage your email notifications from here: https://hackaday.io/settings. Be aware that you can get maximum 1 email per hour. Please let us know if the problem persists. Thanks! I did get an email about you comment though, so I seem to have my issues resolved! This is a brief query to .com not .io .. bear with me. Why no like buttons?! Just read an article, did not want to comment, would like to show support for it .. have zero means of accomplishing that. Adding like buttons is ridiculously simple these days .. and there is header space right next to the share buttons .. please employ. That could be a thing. I haven&apos;t seen them on other editorial/news websites. Seems like everyone decided on share + comment. Anyone know why? Years back every site had those share and like counters .. Twitter and FB have since depreciated those embeds which I presume was bcz they consumed resources and for major sites, revealed numbers they didn&apos;t want. As evidenced by .io and most user content sites, likes (upvotes .. think Imgur/Reddit) work and helps people interact when they don&apos;t want to comment. IMO it would work on HaD and consume few resources. 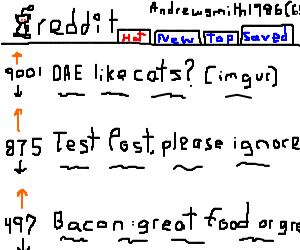 See https://cdn.drawception.com/images/panels/2012/4-27/6b1ZAEjBEH-2.png for how it actually "works" in real life. Imgur and Reddit are social aggregation sites. People like voting—it helps us waste time on the Internet. It&apos;s evil psychology at its finest. People deserve whatever they voted for. See US. Hello. Just started using Hackaday for projects and finding it easy and fun to use. Thanks! * Where the square brackets indicate a link. Thanks, good ideas to improve on images. It&apos;s a little hard to find, but if you select an image in the editor a small &apos;edit&apos; button appears, its modal has a title input which populates the alt and title tag. The text editor needs some serious love and attention. Now that I am tackling a larger writing project inside the editor, I&apos;ve uncovered a few areas to improve upon. A huge one would be auto-save. I lost over 3 hours of work because my browser crashed last night. Also, supporting a standard like Markdown would make everything so much easier. That way, the user could edit their text in any text editor, and then just copy-paste it into the Hackaday editor. Another mild annoyance is the editor&apos;s insistence on making anything with a .py extension into a hyperlink. I&apos;m not sure why it does this, I think it should look for https:// before autolinking. If not, then at least exclude the common file endings, .rb, .c, .py, etc. To get around the auto-save debacle, I started writing in emacs in Markdown. I would then export this to html and then paste that into the HTML view. It actually works pretty well, but instead of using <pre> for code, it uses <code> by default. This does work in the editor, but longer lines run off the side of the screen instead of wrapping. I&apos;ve also heard about the mysterious disappearing images. Frankly, it might just be aliens, in which case there&apos;s not a lot you can do. I suppose the entire site could be converted to text only? That would thwart their dastardly plans! I hope this feedback is of some use! As I spend more time with the editor I will be sure to update my ideas. EDIT: I just remembered something else. It would be *awesome* if we could embed GitLab snippets into the text. It&apos;s just a <script> tag. I tried to add it to the HTML but it was stripped (I&apos;m assuming so users can&apos;t run arbitrary scripts!). I know other WYSIWYG editors I&apos;ve used have an insert GitHub Gist button, so there must be a way to do it without allowing users to insert script tags. It&apos;s by far the most buggy piece of software @ hackaday.io. Constant source of annoying bugs which make it really cumbersome to publish (bigger) projects! A business that focuses on hosting have to take that kind of issues seriously or it would lose its content producers. That was a big part why I move my hosting among other reasons. I had reported multiples SPAM daily here over a 2 years time frame - they won&apos;t even try to incorporate some open source scripts that was available. I shouldn&apos;t be doing their work unpaid. Go back and read my pleas here if you don&apos;t believe it. Thanks, keep the feedback coming, the editor is definitely an important part of the site. Why not switch to something like Quill or Summernote? Or even https://github.com/benweet/stackedit which uses the same version of Markdown as Stack Overflow? There are myriad options out there. No need to build it yourself when there are so many amazing, drop-in solutions for free! Is there an easy way to align or justify the text while publishing something in the project? There isn&apos;t, do you have an example of how you want the text laid out? Just justified on the project log so that short words aren&apos;t left at the edge. I&apos;ll manage somehow. I am on a mission to try to further lock down accounts that are important to me. Therefore I would like to ask for two-factor authentication to be made available on hackaday.io. Pretty please, at least the ability to use a TOTP authenticator app (e.g. Google Authenticator, Authy). Pretty please with chocolate fudge and cherries on top, FIDO U2F (e.g. YubiKey, Feitian ePass) in addition to TOTP, not instead of. And double plus please, with double plus fudge, in a bowl hand-made from a cherry tree, for the love of all that is holy and actually secure, not SMS! Yes, yes, yes! All modern websites that have user account absolutely need to implement 2FA. Most 2FA implementations make it fairly painless to add, although with hackaday&apos;s large user base, maybe it will take a bit more time & ironing out kinks. But I vote this up x100000. My links (normal format) above Heading 2 shows up formatted as Heading 2. They show up normally in the editor. Adding an extra line in between doesn&apos;t help. Chrome 67.0.3396.99 (Official Build) (64-bit) Win7 X64. Same problem in Opera. Thanks, the cascade looks different from the editor to the page. Just to confirm you don&apos;t want that link as heading 2? I want the links as Normal Text. I went in, highlight the links and select normal text, but yet the H2 tags are not removed. One thing about is that I copy and paste the links from another project and it was formatted as normal text.